Will this intense grizzly bear fear stop me traveling? A few months before we left to go on our road trip around Australia, I’d often wake in the middle of the night in a sweat. My fears leading me to visions of crocodiles snapping my daughters up from the river bank during a moment of parental distraction. More than likely, it was Savannah slipping out of my hand and steely gaze to gallop like a horsey down to the bank and those unseen crocodile eyes lying in wait. “I don’t think I can do this road trip.” I’d think to myself. This fear of the crocodiles is too much to bear. I can’t handle the thought of my children being eaten. These visions would interrupt my day time moments as well and they didn’t stop once we departed for the trip either. It was always in the back of my mind and the fear only increased the closer we got to the Top End. It became so intense that while we were in Tropical North Queensland, preparing to start driving over to the Top End, I had made the decision in my mind that we’d just skip the entire top half of the country, otherwise known as Crocodile Land, home of the largest and most aggressive saltwater crocodiles in the world. Despite the intense heat of this tropical area, there would be no swimming. Not even in the beaches as the crocs liked them just as much. It wasn’t like I hadn’t experienced crocodiles before. We lived in the Kimberley Region of Western Australia for six months working on a pearl farm. Crocodiles would greet us every day on our boats. They’d even lie in wait on the other side of them as we waded through knee deep water to get into the boats during the extreme low tides that took them far from our usual boarding jetty. But, this time I was taking my daughters and the fear of those cunning creatures got the better of me. Recognizing my fear was completely irrational, I held back and came up with a plan to appease it. I couldn’t miss out on incredible adventures just because my mind wouldn’t stop showing me the highlight reel from Jaws Crocodile Style. Talk the girls daily about the dangers of crocodiles and to never ever go in the water or near the water’s edge. And just never slacken off the job and keep a close eye on them. A simple yet effective plan. Now whenever we go near a river Savannah asks me if there are crocodiles in them. She certainly didn’t horsy gallop down to any river banks. We ended up staying in the Top End for nine months. Nine months with those fearsome beasts and not so much as a snap. Although, we did avoid a certain river crossing where they hang out for those cars that break down halfway across! I just was not prepared to trust ourselves in that situation. We had incredible adventures across what is my favorite region of Australia. I would have missed out on so much joy had I given into my fears. I’m now facing them again. This time as we prepare for our RV road trip across the USA to the Mountain states, the South West and Western States, my night dreams and daydreams are overtaken by the girls running ahead of us on the hiking trail and meeting up with a Grizzly bear. It brings an ache to my chest and a pain in my stomach and stops me in my track. The fear of those grizzlies is so intense. Would I feel this same fear if the girls weren’t with me? I’m not sure, but the fear certainly stems around my momentary slip of attention that draws in a grizzly bear attack. 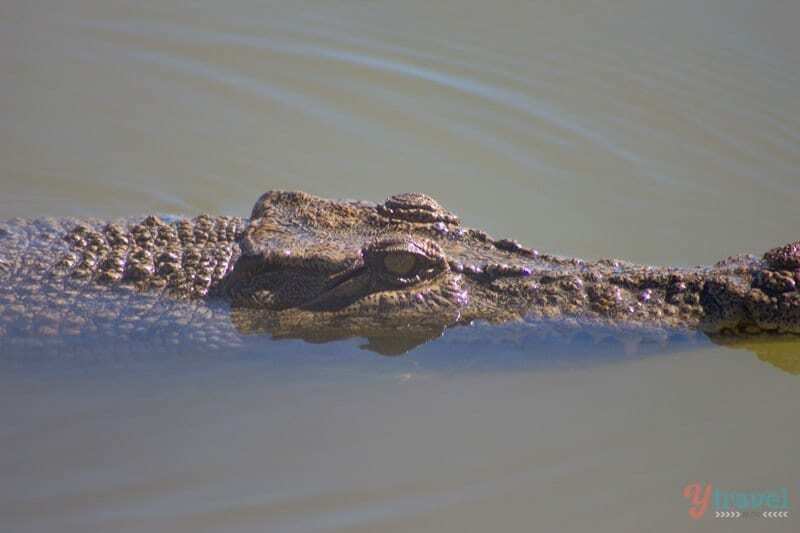 At least in the Top End of Australia you can easily avoid a croc snap by just not going on or near the rivers. In Grizzly country, you could round the bend on a beautiful valley hike and run into one ready to ferociously defend her young. And we’re considering going to places like Yellowstone and Glacier National Park during the spring, right when the babies are a plenty. It’s not like we haven’t experienced that. 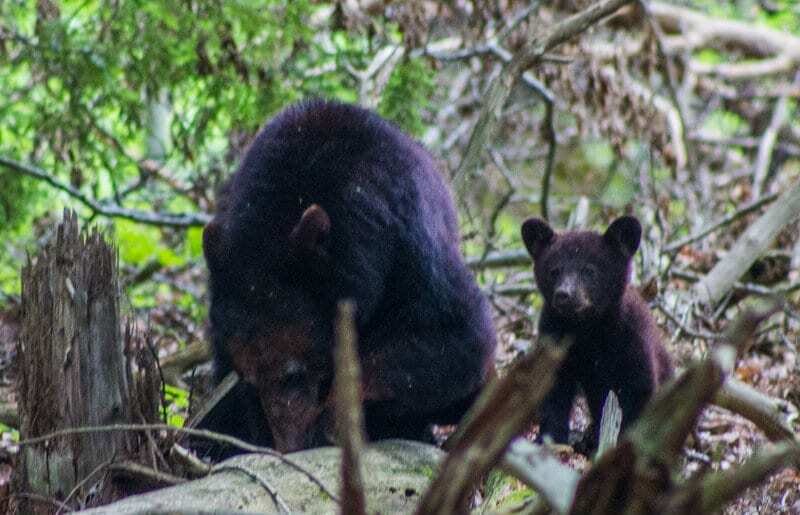 Last year, we came across a mother black bear and her two babies while walking in the Great Smoky Mountains National Park. I wasn’t scared one bit and delighted in standing so close watching them. But, they weren’t grizzlies, but black bears, and there were lots of people around. It’s the only time in my life a fear has worked really hard to stop me from traveling. I know once I get there I will love it, but the fear, at this stage is so intense and large, it could hold me back. The only thing we have to fear is fear itself right? They plague us day and night, and many times with good reasons. My daughters getting eaten by a grizzly is good reason not to go. But, what if we do go, and have the most incredible experiences and never see one single bear? Even if it means hiring a guide to stay out in front and protect us, I’ll do it, if it means we can have these moments and adventures together as a family. Note to self, do not ever watch that bear scene from the Revenant ever again!!! And, if you enjoy posts like these, join our VIP email community, as they receive personal stories and updates like this – designed to help you become your best self and live the life of your dreams, despite all those fears! Sign up box down below. How many times in your life have you let an overwhelming fear stop you from moving towards your dream? Do you have any tips for bear safety?